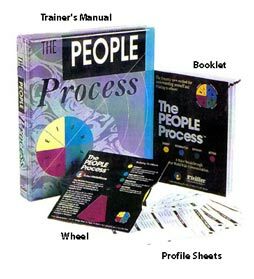 The PEOPLE Process® can be ordered here online. You may choose quantities once you click "Add to Cart"
American Express, Discover and Paypal account funds for payment. A 21-slide Presentation for use in conducting training on personality type with complete script, participant handouts, name tag template, and participant certificate of completion. Click here to view a screen shot or click here to download a three slide demo of the presentation.